Our weekends are pretty standard. We’re either photographing weddings, doing yard work and/or figuring out where to get a burger. TJ could eat Kopps everyday. I feel pretty confident he would, in fact, do that if he were single. We compromise on Burger Sundays and all is happy and healthy in the world. * This particular Sunday, we were off to Stack’d so I could get my bloody fix and TJ, his burger. This was my first time at Stack’d at 170 S. First Street in Milwaukee. I was surprised to see five bloody marys on their menu. Although all sounded tasty and interesting, I opted for the Kick In The Pants per recommendation of the bartender. Mix: I knew I’d like this bloody mary based on the fact the description reads: “House Infused 5-Pepper/Garlic Beyla Rus Vodka, House Made Bloody Mary mix, tomato juice.” I’m a huge garlic fan. Like, I’m not sure how I have any friends with my kickin’ garlic breath (just kidding, I brush my teeth a lot). The bartender mixed this up right in front of us, which I always appreciate. First ice, then vodka, then a yellow mixture that I’m assuming was the pepper/garlic, then a dark mixture which I’m assuming all of their bloody mary spices are in, then tomato juice. It was so good, you guys. The menu says their mix contains O’so Nitro Train Porter which I can’t say I’ve ever had. Whatever they’re doing was right on. The garlic was strong, the spices were good, the texture was spot on. Well done! Garnish: Classic. This one came with a large pickle slice, a beef stick, lemon, lime and green olive. No cheese and I didn’t miss it. Chaser: Yes, this came as a choice of O’so Nitro Train Porter or Riverwest Stein. I chose Riverwest Stein to just mix it up a bit. It went well! Buzz: No buzz grew at Stack’d. It’s not to say there was little vodka in the drink though. I watched the bartender pour it himself. TJ and I shared this one because we both liked it a lot. Cost: $9. A very good price for such a great bloody. If you follow our site, you’ll know 4th Base has been in the Top Contender spot for almost a year! It certainly deserves it and will always hold a special place in my heart. I’m not replacing 4th Base – it was just moved to its own, new category of BMOM Favorite. Stack’d will be taking the Top Contender roll for now… I highly recommend it. I can’t wait to go back and try their other four varieties. Maybe I’ll get super crazy and do it in one visit. *TJ may or may not be happy with one burger per week. 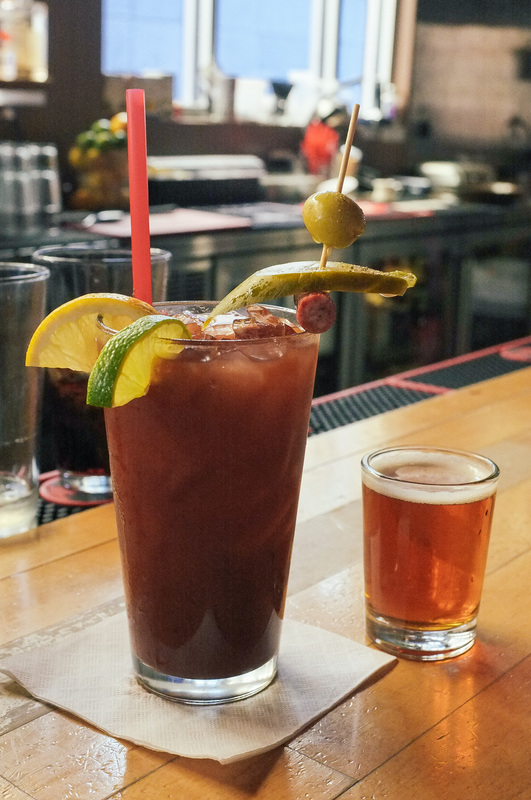 This entry was posted on November 9, 2013 by Shannon in Bloody Marys in the area and tagged Beyla Rus Vodka, Garlic Bloody Mary, O'so, O'so Nitro, Stackd, Stacked.